Biography of Zeng Feiyang, one of the 21 Chinese labour activists detained on December 3 - the latest wave in the criminalisation of labour actions, and general repression of social resistance in China since 2012. Translated by "Solidarity with Chinese Workers" from《曾飞洋：14年寻路劳工服务 带领劳工NGO转型》by Xing Xiaowen (邢晓雯) and Wang Yangyang (王洋漾), published in Southern Metropolis Daily (南方都市报) on December 10, 2012 - original taken down, apparently, but reposted here and below. This old, brief biography is translated and published here as part of an effort to resist the Chinese state's escalating offensive against workers and independent social forces in general. For updates and solidarity actions, follow the Facebook page “Free Chinese labour activists now 馬上釋放中國勞權人士“. 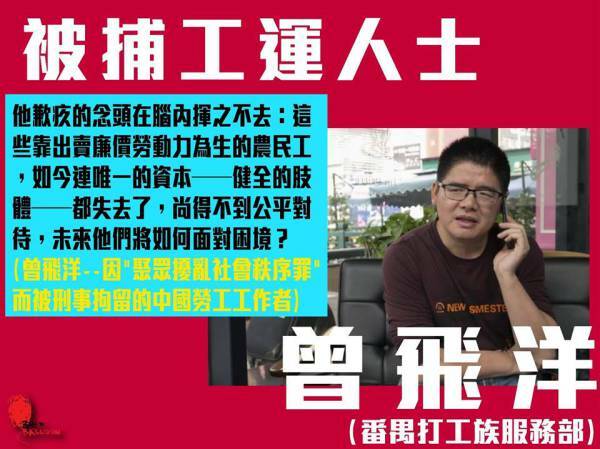 For background, see “Guangzhou labor activists arrested en masse”, "Sweeping the house clean of labor NGOs", and “The criminalization of strikes since 2012“. Another brief bio of Zeng Feiyang was published in English on Red Balloon here. Zeng Feiyang is a soldier ant, perhaps even a general. He bears the pain to which society is numb and redresses the unfairness where the law has repeatedly failed. In a multitude of deformities, he works tirelessly in pursuit of life's perfection. He is the bedrock of an era. Zeng Feiyang's Panyu Dagongzu Service Center was founded in 1998. Like many of us, he had never heard of the word 'NGO'. Then, Zeng had only a simple desire to render legal services to migrant workers who were owed wages or sustained work-related injuries by helping them to recover some compensation, and eking out an existence with the centre in so doing. In 2000, a happenstance opened up the horizon of the passionate youth and he sought to remake the organisation. Thus was founded what others see as the first labour NGO in the country. Zeng could have led a wholly different life. After graduating from university in 1996, he returned home to work at the Nanxiong municipal justice bureau and became a civil servant. But the carefree job made him anxious. “My heart hid a flame that had no place to burn” (he says). Less than a year at the bureau, he quit the job and came to Guangzhou to work in a community-run law firm. At that time, Guangdong was a place that saw a great concentration of migrant labour. At the law firm, Zeng came into contact with many unfairly treated migrant workers. Sometimes, he was compelled to do the bidding of their agents and this made him extremely conflicted. Later, Liao Xiaofeng, a worker from Sichuan changed his life. Hailed by the media as “Captain Justice”, Liao had taught himself law and often assisted migrant workers in recovering their wages. Not long after their meeting, Liao established the Dagongzu Service Centre in Panyu. In the July of 1998, Zeng resigned from the law firm and went to Panyu to support Liao. In the founding days of Dagongzu, the centre's main scope of activities were: providing a rights hotline, receiving letters and visits, and providing legal advice to migrant workers; working with relevant legal institutions on cases of rights violation, to provide legal aid and so on. The centre depended on low-cost service fees to sustain operations. What Zeng could never have forseen was Liao's adamant departure from Dagongzu a month or two after establishment, leaving him alone to run the show. The latter had underestimated the difficulties of running an organisation. With commissions difficult to cash in, the centre was without a source of income; daily administrative expenses, staff wages and rent became serious problems. In the worst of times, the five full-time staffers had only 15 yuan a day for food. Zeng's girlfriend of three years left him in this period. It was only until 2002 that Dagongzu had its funding in place, remade into an NGO and no longer having to ask the migrant workers they help for every legal or service expense. And so, the then 28 year old Zeng, created Mainland China's first “labour NGO”, held up by people as the symbolic beginning of a worker mutual-aid movement. In a fast developing China, establishing an NGO is not hard. The difficulty lies in sustaining one. It has been 14 years since Zeng Feiyang's entry into Dagongzu in 1998. Having led the development of a labour NGO, Zeng bore witness to the growth of civil society in the country. Zeng has been a long-time observer of the development of capital-labour relations in the country. He finds that in three areas - wages, social security, the prevention and treatment of occupational hazards – things have remained out of kilter; not only does this state of affairs run up against the workings of a relatively developed market economy, it will accelerate the intensification of social contradictions and is becoming a great source of uncertainty for the future stability and sustainable development of China. Now Zeng's NGO is paying more attention to the mass actions conducted by enterprise workers. Zeng thinks that only by improving the mechanisms for collective bargaining will workers be truly part of the factory workplace. “This is an important guarantor to realise China's sustained growth in the future," he says. Zeng is the person in charge for Panyu Workers Service Center. He graduated in 1996 from Law and Politics, South China Normal University, later entered into Justice Bureau of his home county. He however was not satisfied with his well-paid job. In not more than one year, he joined instead the Guandong Jing Lun law firm. At that time, the law firm was the top among others, and was with good prospects for career development. He was asked to give legal advice to enterprises on all sorts of legal questions. Labour disputes are one of the kinds that is the most difficult. His role was to bargain with workers on behalf of the enterprises. Gradually, he became guilty of what he was doing — Those workers that he was asked to bargain, if not confront, were farmer-workers that sells their cheap labour for a living; what were they left with when their only “capital" — their bodies — were seriously injured? With this unfair treatment, how could they possibly continue their lives? Therefore he joined Panyu Workers Service Centers, previously called “Panyu Workers Documents Preparation Service Group". At that time, Zeng like all other people were unfamiliar with the operation of NGO. He just wanted to contribute to labour rights! He then gives legal advice to workers who are injured and are victims of wage arrears, with very humble remunerations. Until 2000, an opportunity came up to inspire him to transform “Service Group" into a labour NGO called “Panyu Workers Service Center". Since its establishment, it has helped thousands of migrant workers through providing one-to-one assistance and agency services, etc. Zeng was once awarded the “Charity Award" by the Responsible China 2012 Charity Ceremony, organised by Southern Metropolis Daily, because of his enduring labour work. But he was also physically attacked on December 2014 at his office by an unidentified person and got his organization’s license suspended. “Workers should not be left with hopelessness and helplessness. It is the society who neglects their need for legal advice." Zeng feels that we should do something for them.